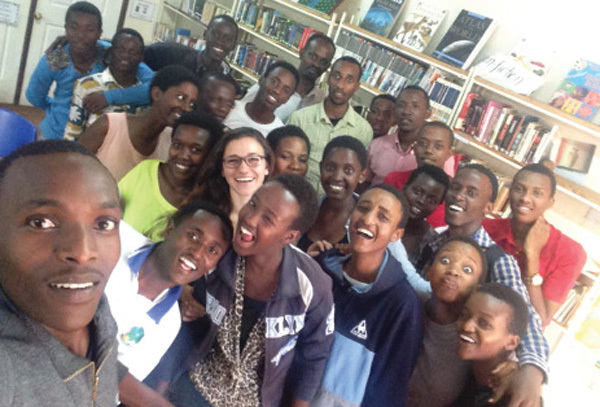 Naomi Stanway with members of the students she advised in a youth village in Rwanda. Naomi Stanway, who grew up in Ocean, got used to cold showers, electricity turning off unexpectedly, eating rice and beans for lunch and dinner of every day, and dark clouds descending on the Rwandan valley in the rainy season. She completed a one-year fellowship in November at the Agahozo-Shalom Youth Village in Rwanda through the American Jewish Joint Distribution Committee’s Entwine Global Jewish Service Corps, and after a few weeks at home in New Jersey, she returned for a second year, at the village’s request. ASYV is a residential community for orphans and vulnerable youth. Founded by Jewish philanthropist Anne Heyman and first opened in 2008, it was conceived in the aftermath of the Rwandan genocide to benefit the resulting orphans, and modeled on Israel’s Yemin Orde, a similar village for at-risk immigrant youth that was created in the aftermath of the Holocaust in 1953. As teens arrive at ASYV, they are placed in groups which become their “families” over the course of their stays. During Stanway’s brief respite at home — she arrived Nov. 21 and departed Dec. 21 — she spoke with NJJN and reported enjoying “sleeping, eating, and catching up with friends.” And on Dec. 9, she offered a presentation about the village at Temple Beth Miriam in Elberon, where her father, Cy Stanway, is the rabbi. With NJJN, Stanway, 25, discussed her experiences, full of “big moments and small moments,” as she put it, developing an English enrichment program, managing three libraries in the village, and advising the student government. One of the “small” moments, she recalled, happened during a downpour in the middle of the rainy season. When it rains, she said, it pours. “The country comes to a screeching halt and you stay where you are.” On one such afternoon, she watched the storm arrive with some of her students in the library. It started to rain and then the power and Wi-Fi went out. Stanway graduated in 2013 from the College of New Jersey with a degree in education and psychology, and spent two years with Teach for America in an elementary school in Alamogordo, New Mexico before heading to Rwanda. Although she had to make some adjustments to life in eastern Rwanda, she said that the village is self-contained and offers modern conveniences not readily available elsewhere in rural Rwanda, such as running water, electricity, and Wi-Fi. Still, she worries about her role as a white American coming in on a temporary basis. She’s had some big successes — in addition to reorganizing and digitizing the three libraries, two in the high school and one in the residential area — she helped the student government completely re-envision itself. When she first arrived, she said, 10 students comprised a “loose assortment with vague titles, no structure, no meeting time, no mandate.” Stanway helped them brainstorm ways they could be useful in the village to kids and adults. They appointed a president, vice president, and eight ministers. “As soon as we started calling them ministers, they felt empowered, important, confident. And the rest of the kids were so excited to support them. Everyone was talking about the minister of education or of health and wellness. They knew who to bring their issues to,” she said. Under her guidance, they wrote a constitution, created judicial procedures, set term limits, and provided grade requirements and expectations. Being Jewish in Rwanda is a little tricky, she said. On the one hand, Jewish values like repairing the world are part of the building blocks of the village. 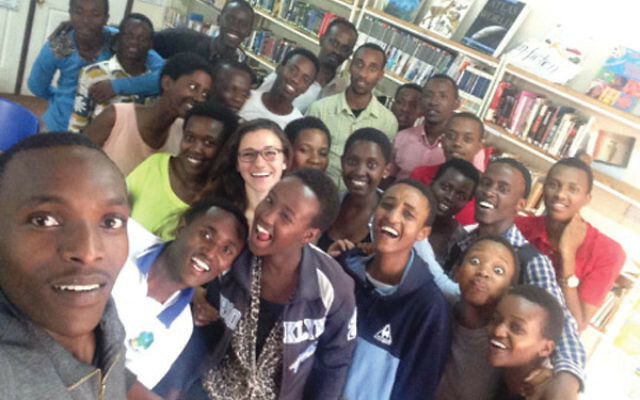 “It’s interesting to hear a bunch of Rwandan teens talking about tikun olam,” she said.